July 5: Today is my first day of Go School. This is a very weird experience. I can’t understand anything that other people are saying, but somehow I feel like I have learned a lot about go today. The Koreans are very strong and I like the general Korean style that most people play. They like thickness very much and they like to fight aggressively. It amazes me how dedicated these kids are to go. Every day they have formal go study for 12 hours and then when they get back ome they study until 11PM when they go to sleep. Most of the people here my age are 9-dan and are aspiring professionals. It surprises me the gap in skill between a 9-dan and a 1-dan professional. There are even some 9-dans that aren’t inseis because they are weaker than the other 9-dans. There are many 9-dans who are very strong, but only a few become professional every year. A bit of food for thought is that these kids are able to give their all just for a small chance of becoming a professional. 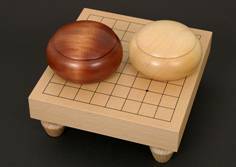 They seem to live in a closed world of go. If they have free time they study go and they eat while they look at top go player’s statistics for “fun.” I lost all my games today even though I am playing with their very young students. 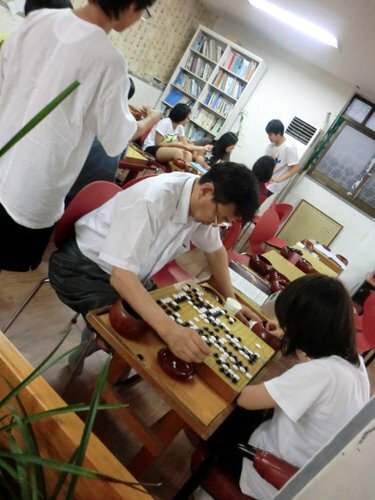 Photo: Headmaster playing a serious go game with a student.